The point is if you are seeing spikes anywhere you might want to change to a rectifier that puts out a smaller spike or no spike in the B+ supply. One could also try implementing an RRSF filter between the heater secondary and the tube sockets. 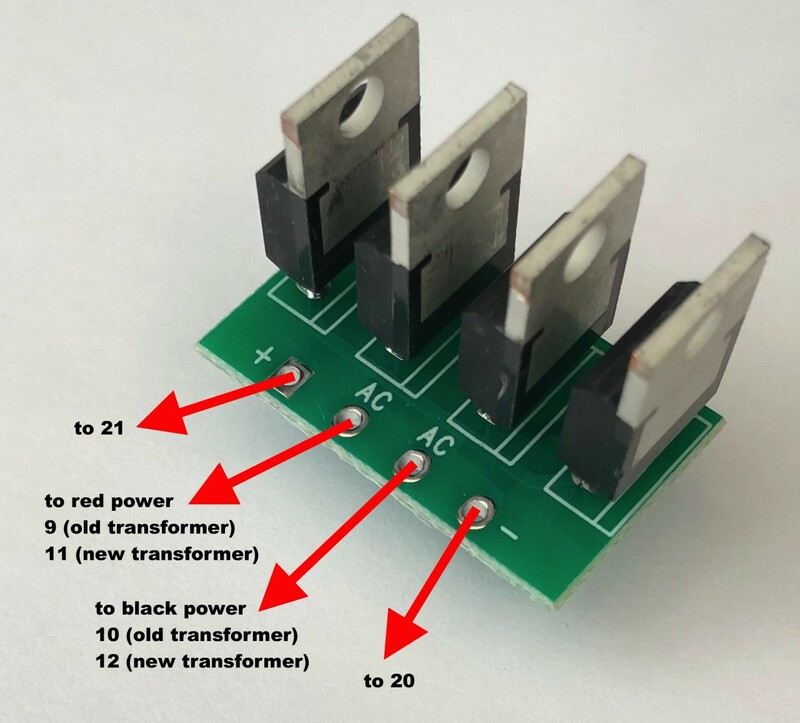 This is tricky because you are pretty much limited to caps without any R or L, since they will add too much resistance to the circuit and the heater voltage won't be right. This is why we went with the UF4007s. If the rectifier is quiet there is no spike that needs to be filtered. I know I'm a bit behind here in terms of the age of the thread, but I've just fitted the Cree based rectifier in my Crack, and can immediately recommend it. Cheap, quick, and no doubt that it is now pulling more detail than I was hearing before. I can't really argue with hearing new things. pardon my ignorance, but is there BOM for the parts needs for the Cree/schottky rectifier mod? Any instructions too? I sort of get it from the pics for the cree/board, but I'm not sure about the Schottky diode. This seems like an easy, inexpensive mod that I would like to try. My Crack: Siemens Silver Plates or Telefunken ECC82, NOS Tung-Sol 7236, all silver wire, choke, speelball, diode rectifier mod, stepped attenuator. or Google "Discrete Bridge Rectifier PCB - TYPE 2 (TO-220 Radial Style),"
If they're out let me know - I bought a few extra the last time. If you want to go all out, I thread the hole in each diode via a tap, and then screw a nylon bolt through each diode, spaced 1/4 " apart. thanks. That's the board. What cree diodes are needed? And what Schottky diode is needed? Cree is the brand name, shottkey is the component type. Disclaimer - any information supplied is what I used under my own guidance. Your ability to loosen the magic smoke is entirely up to your own skill level. You need to read through the thread all the way carefully. Especially noting that if you install these wrong or are not careful in what you're doing you can shock yourself or destroy the components. Got it. I was schooled on Head-fo too. I'm a-learnin'. I've recently learned which way goes up on the tubes! Ok. I got my board and diodes. I would just like to verify the next steps. 1) Remove the 4 rectifiers at 18,19,20, and 21. 2) Wire the board as show in the diagram below. I will probably just glue a nylon spacer to the bottom of the board and then to plate like shown earlier in this thread. I assume the wires should be twisted to the board, also as shown in some of the earlier posted pictures. Curious to hear the different in diodes myself but the board is forever not available. I see they have an assembled one but it's not using schottky ones. Is it what I need? As a last resort I'll get it just for the board and replace the diodes. I might have a spare or two. Let me know if you still need one.